I remember the “old days” (i.e. the 1980s) when there did not seem to be food trends. The same cakes appeared in shops and cafes up and down the land, year in, year out. Fast forward 20 years, and I’ve notice in the last two weeks that coffee and walnut cake seems to be everywhere. I think this is an interesting response to the recession/depression/armageddon we are in the middle of, but Britain is seeking comfort in old favourites, but with a new “old favourite” popping up every few weeks. I remember my mother used to make these cakes when I was young, so this is my attempt. The eagle-eyed of you out there (I am assuming that someone, somewhere is actually reading all of this…) will notice that I’m not talking about “cupcakes”. To me, this difference matters. American cupcakes are huge. Actually, they are too much for one person to eat, and I know that very often you would share one, but I have issues with the idea that one of these things is intended as a snack for one person. In Britain, we use the rather marvellous term “fairy cakes”. Small, light, whimsical and traditionally small sponge cakes with butter icing and covered in lurid hundreds and thousands. Fun! The point is that they are about a quarter of the size of their US cousins, so they really can be a little treat that you don’t feel so bad about. 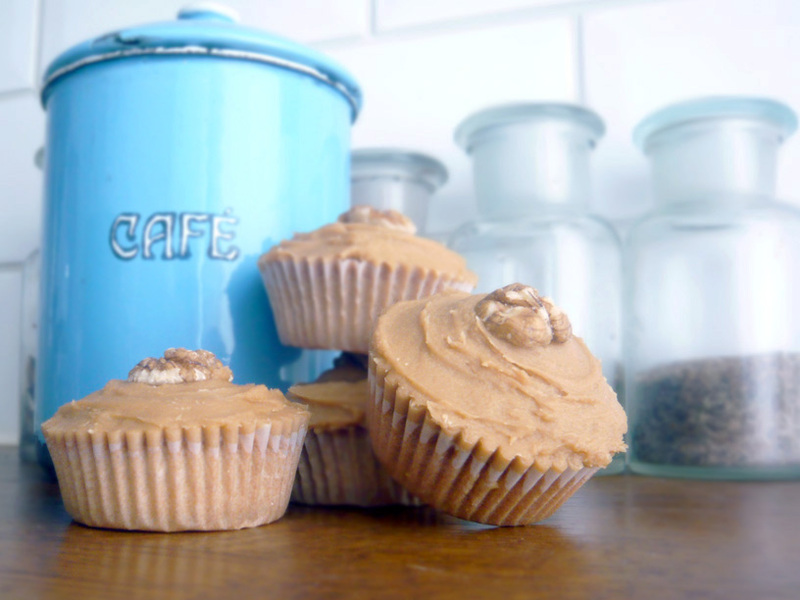 The coffee/walnut combination makes them more mature, with the walnuts providing some interest alongside the coffee. Cream the butter and sugar until light and fluffy. Add the eggs and a spoonful of the flour, and mix well. Add the cold coffee and the chopped walnuts, stir well, then add the rest of the flour and the baking powder. Divide the mixture between 12 fairycake cases (make sure these are the small ones – if you use the larger muffin-sized cases, they won’t be full). Bake for 15 minutes until lightly browned, then remove from the oven and allow to cool. Combine the butter and icing sugar in a bowl and mix by hand until combined. Now add the coffee, the use an electric beater (or hand whisk if you prefer) to get the mixture really fluffy. Use it to top the cakes, and press a walnut half onto each cake. Voila! Would I make it again? Well, that’s a bit of a cheat as this is my recollection of a childhood favourite. I love them, but be careful with the coffee – if you do use instant, it is easy to go crazy. Remember, we want a taste of coffee, not the feeling of sucking on coffee grounds!